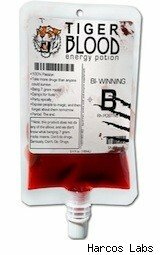 Charlie Sheen's wacky declaration -- among many wacky declarations -- that he's special because of tiger blood has spawned a "Tiger Blood" punch-flavored energy drink that sells for $4 in an IV bag. The liquid is red and it has 80 milligrams of caffeine and some iron, which of course blood has. The packaging says it's also made of "100% passion," but we're not sure if that's juice from the actual fruit or a super-special-secret ingredient. "Winning!" or not, this bit of merchandising gimmickry comes courtesy of Harcos Laboratories, which admits it has no ties to Sheen whatsoever. In honor of Harcos' marketing chutzpah, WalletPop serves up a few other beverages with celebrity roots.In November 2006 Danny DeVito appeared on The View loopy from too many limoncellos with George Clooney the night before. Talk about turning lemons into lemonade: DeVito parlayed the widely circulated clip on YouTube into his own brand of limoncello, Danny Devito's Premium Limoncello. A bottle runs between $23 and $30 but does not come with George Clooney as a drinking buddy. If there's a rock n' roll heaven, the makers of Hendrix Electric Vodka probably aren't going there. The spirit debuted in 2006, featuring Hendrix's iconic afro and most of his face at the top of the purple-hazy bottle (we kid you not.) Let's keep in mind that Hendrix reportedly died by choking on his vomit after a session of partying that included alcohol. Good taste won out when the brand was yanked off the market and the company had to pay a $3.2 million trademark infringement fine. Jimi can rest in peace, even if we can still get a bottle on eBay for $29. Goth-rocker Marilyn Manson turned his love of absinthe into Mansinthe, made by a Swiss distillery and going for about $60 a bottle. This is a man who once told MTV that he binged on the stuff to reach a state of lunacy. In an age of over-shared debauchery, he sounds like your average pitchman.